Here’s the varieties I’m looking into planting this year in my garden. 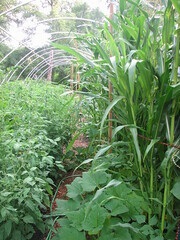 I’m trying to pick high-yielding veggies appropriate for our zone, which is 6a/7a. My seeds come from Fedco, Bountiful Gardens and Baker Creek. I also do some trading with friends. Kale- dwarf Siberian, red Russian and white Russian. Tomato- my cold weather tomato will be Crnkovic Yugoslavian. Amish paste is my standard canning tomato. I will also grow Rutgers and Homestead and try Tomato Spear’s Tennessee Green, Roma and royal chico for the first time. Carrot- Autumn king, Atomic red, tonda di parigi, Amsterdam, and cosmic purple. Turnip- purple top white globe. Lettuces-anuenue, little gem, parris island cos romaine, winter bibb, mangetaspreen, dandelion, stinging nettle, deer tongue, pirat butterhead, black seeded simpson, tango, winter marvel, majestic red, pablo, strawberry spinach (which really isn’t spinach) and anything else I can seed swap for. We like a wide variety. Sweet potatoes- I’m not sure yet, but I have until May to decide. I’m not doing corn this year due to space limitations as compared to yield. Collards are one of the few veggies I will not eat. I think I’m going to leave out the rutabagas, too. I also decided not to grow another monster Candy Roaster squash plant this year due to the space, as well as any grains. Now I must plot the garden out then pick both culinary and medicinal herbs based off of how much space remains once I fit all of the veggies in. Then I will make a list of how many plants to start and on what date. The week before Christmas, we had 15 inches of snow unceremoniously dumped on us. We had a half-white Christmas. It still hasn’t completely melted. And we’ve had more snow repeatedly fall since then, more times than I care to count or remember. The end result of the white blanket was a total collapse of my garden structure. Today, it started snowing again. We chose to live in North Carolina, in part, because while it does get cold here for a few weeks a year, it normally doesn’t dump snow like this. Where’s that global warming we were warned about? It’s not here, because this is the coldest winter they’ve had in Asheville since before I was born! The end result of all of this white mess? Garden Fever.